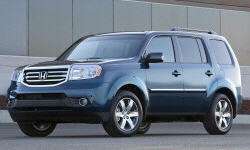 See TSBs and recalls for the 2015 Honda Pilot. US $1000 Had a check engine light. Turns out it was a catalytic converter. I thought this was way early for this to happen. Along with that the O2 sensor failed. Not happy. US $850 Timing belt, water pump, timing belt tensioner, drive belt replaced. Also had a front driver side wheel bearing that was bad and it was replaced. $1200 was the total price for this Differential. This was my fault. For the last 20 years I’ve had front wheel drive automobiles. We bought this 4 wheel drive pilot and it slipped my mind that I need to replace the differential fluid. I maintain all my cars. Changing fluids brakes and filters. The major stuff which requires special tools and tricks of the trade I hire out. I did look through the owners manual and it did not have a maint schedule. If I would have seen that it may have triggered my mind to change the differential fluid. Honda recommends changing the differential after the first 15000 miles and then every 30000 after that. Well I didn’t change it until 90000. Oops. That cost me. A used differential will cost me $850 parts and labor at this great shop in Charlotte. A new one from Honda cost $4200. Well lesson learned. Won’t do that again. 10000 mi Check engine light came on to change transaxle fluid. Dealer stated false ready nag. 5000 mi Glove box latch broken. Replaced under warranty. 13500 mi A/C got worse at handling summer heat. Dealer ran dye, no leaks, but the system was low on "freon", probably from factory (?) Repaired under warranty. 16000 mi Housing between steering wheel and dashboard loose and rattling. Not fixed on first trip to dealer, taking car back in October. Should be warranty fix. Somewhat indicative of an interior not up to the standards of a car of this price! 27000 mi 2nd time in 14 months that the AC lost all of its charge. Fixed under warranty. 36000 mi Housing between steering wheel and dashboard loose and rattling. Dealer couldn't ever find it. I just slammed my hand on the housing anytime it would rattle. 36000 mi Front end made a clunk noise at slow take off. Problem still persists, dealer cannot determine the issue. 25000 mi replace rear window wiper stop. 6700 mi Sunroof fell apart, required complete replacement, under warranty. Sunroof would not close, gasket/trim came out of place. Repair attempt failed. Scratched roof in process of replacement. 1000 mi Replaced washer fluid tank. 13000 mi REPLACED 1 REAR SHOCK (NOT 2). STEERING WHEEL CLICKS WHEN TURNING. THE PASS WINDOW RATTLES. STILL THUMPS OVER BUMPS. HONDA WON'T FIT THIS JUNK OF MINE. Jan 2017 Driver's side sun visor sometimes wouldn't stay fully up...dealer decided to simply replace it. See our lemon odds and nada odds page to see vehicles with no repairs or vehicles with more than three repairs. To see how frequently 2015 Honda Pilot problems occur, check out our car reliability stats.